Web Browser is becoming a music application’s platform. That platform consists from two APIs such as Web Audio API and Web MIDI API. 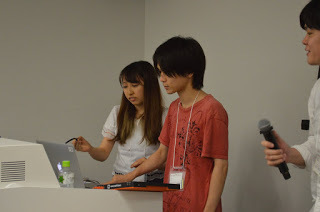 “VJ and DJ” was the theme for the Hackathon this time. 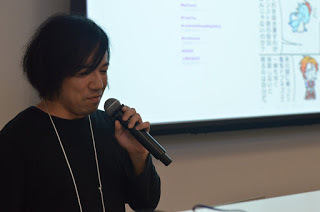 The hackathon does not have any themes before, but great apps had been hacked at the hackathon, so we wanted to try hack not only application but live performance by web applications this time. So the theme was decided as “VJ and DJ”. This time 5 great apps were chosen as great app!! Let’s take closer look at hacked app one by one from the greatest app. All of client that displaying the application becomes part if the synthesizers, and those are controlled by master application which external MIDI devices are connected. 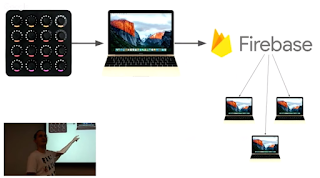 Technically, control message is synced through Firebase. At this demo, clients are divided into 4 groups, and each groups are playing different sounds. 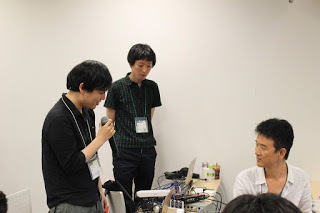 With this application, client of audience is part of instruments, so speaker may not need to have live performance and audience is not audience anymore. Basically, the app is step sequencer with sampler, but the sounds of the sampler is the voice which is made from Google trend words. And these voices are created by “say command” in Mac OS, and words are obtained from internet automatically. Great point of this app is that sending MIDI clock and recieving MIDI clock is supported. So it is easy to play along with DAW or external MIDI devices. So eventually, trend word can be filled in to any DJs play really easily. Basically MML parser of Chrome extension, but parsing MML in the Twitter tweet. And cool feature is that this extension is enabled play the synthesizer of external URL with using WebSocket. This extension is able to parse and play MML only by selecting MML in timeline. It might be great work on taking memo of phrase that you are inspired from something. It remind me Yamaha’s QY series sequencer. 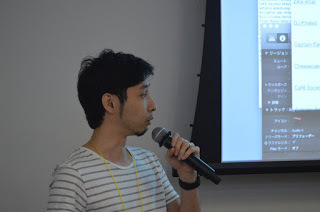 The clients which runs this application becomes controller, and remotely connected synthesizer is played by manipulation of those clients. This application is also using Firebase to send controll message. With using this application at live performance, performer is able to perform with audience and to know how much audience have excited by the performance in real time. Drum pattern generator, and the pattern is controlled by MIDI controller. This pattern generator is sending clock to external MIDI devices to collaborate other synthesizer. This application is really natural tool for DJ playing. 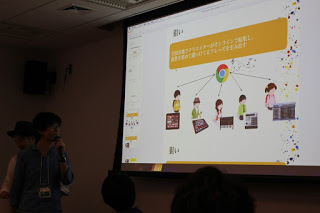 Applications from this hackathon tend to become real web application, but this idea is natural/legacy DJ tool on browser. Configuration app for DIY MIDI device. 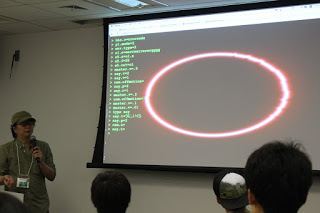 App was hacked at this hackathon, and the device was hacked by his hobby. This DIY device allow user to create touch sensor application easiy. 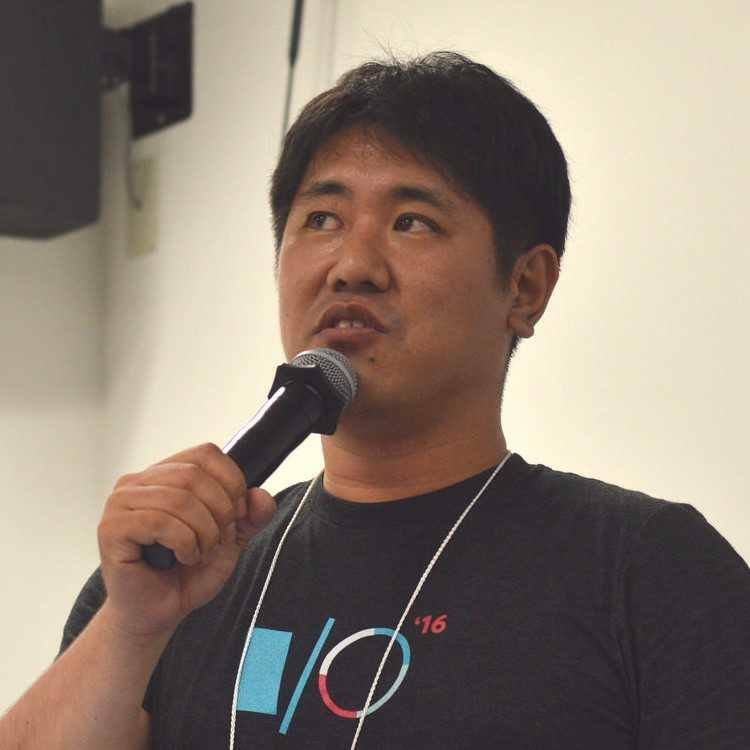 He is the one of the guy who has been joining all of Web Music Hackathon, and he developed initial application/device at #2. Watch this videowhat we can do with this application/device can do. 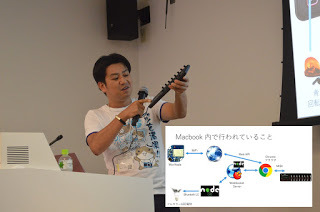 Whole system is that manipulating independent devies, a.k.a IoT devices, by MIDI controller connected to browser using Web MIDI API. And those controll messages send through internet. All of the controlled devices are light related devices, such as multi color light bulb(Hue), revolving light, tape LED and EL wire. 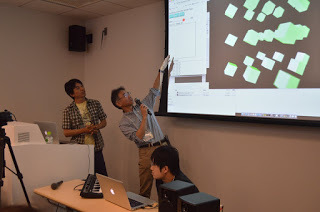 The concept of this application is making music by various input. Let’s take image for example. Image have lots of informations as color, and assume blur the image. 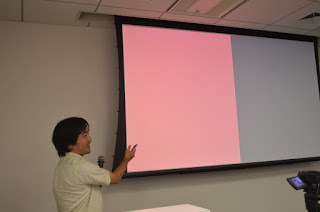 After blur the image, some area may change to vivid color. Then play that blur image as step sequencer to assuming NoteOn as vivid color area. This happen in real time. So, the application does real time automatic music creation. In this example, eventually the system is automatic VJ system since image are given, and music will be created by that image. Reflect motion from camera to image effect, and sound effect. Basic idea of this application is also auto generated video for DJ. Cool feature of this application is that sound effect is created by detected motion by camera, and that effect reflects to sounds. 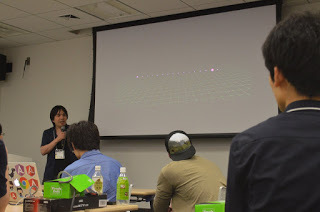 DJ get accelerometer data from audience’s mobile phone in real time. And those DJ decide a way to use those data. In this demo, those data is assigned to control sound effect type and value. So the application indicating one of the way to collaborate with audience by obtaining extra data from audience and use that for material to make music for DJ. Basic idea of this application is that using smart phone speaker of audience for delivering DJ’s music. 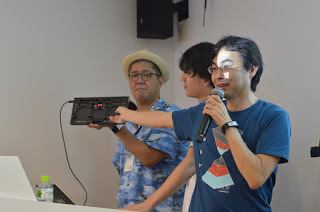 So DJ is able to play remotely, and also big speaker does not require for DJ performance. 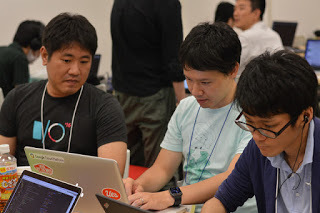 However, development of the application was not complete during hackathon. 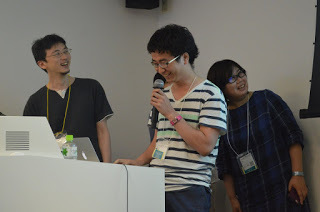 This team had been struggling to run application that they wanted to refer, and time was up. Connecting number of client(PC, mobile phone) by WebSocket for having music session. In this demo, using MIDI keyboard, and mobile device to manipulate and generate background VJ. This application allows audience to join along with DJ/VJ performance from audience’s seat. 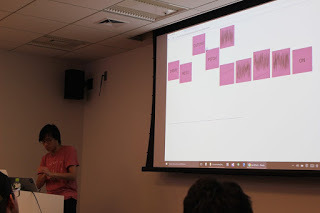 Initial idea is that recording DJ performance as format which has time management feature, Standard MIDI File for example, and also isolated from music. And to save/share/re-produce that file for anybody who wants to re-produce that performance. Key point of this idea is practical, that is not to be required to take care of copyright by isolating DJ performance from music. 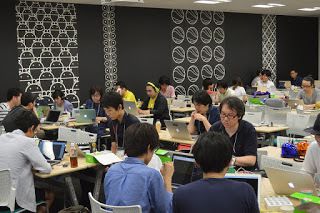 However, the application development had not been completed during the hackathon. 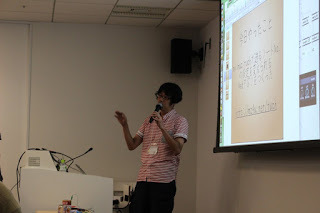 These 15 applications are the application which is developed by attendees at Web Music Hackathon #5. 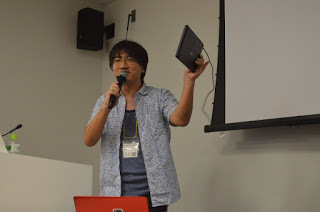 But there are Bosses (it is just like a video game does) around Web Music community in Japan. 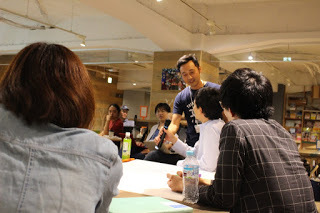 Bosses support attendees during hacking time, but they usually also develop application for having fun. 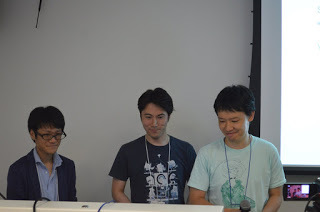 And three Bosses had developed their application, so let me introduce these applications, too. Sequencer GUI is usually 2D, but this application is providing GUI as 3D. “Seeing is believing” kind of application. So, please take a look at Performance Video. Super Cool!! LiveBeats is the application that change your computer to musical instruments. And this time, speaking feature, by web speech synthesis, is added. I love this kind of live coding musical instrument application. This application is also “Seeing is believing” kind of stuff. 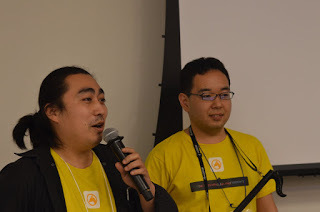 These are the all about applications that were developed at hackathon this time. I have learned that having small pre event before the actual event might be one of the important factors to obtain much higher level achievements to everybody who join the event. 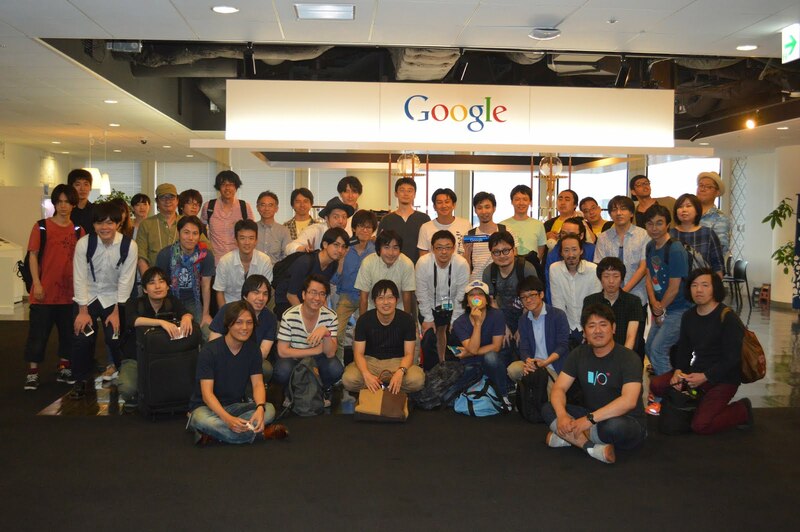 I would like to say thank you for all of attendees who made effort to develop applications. And also I would like to say thank you for all who support entire event. 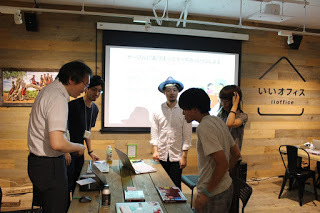 Web Music Hackathon might be back. So please stay tuned!! See you next time! !